The political and economic setting facing the union movement today is, perhaps, the most difficult since the Great Depression. Unions had already confronted two decades of unrelenting assault from neoliberal policies of labour market flexibility, austerity and political conservatism. Then, the global financial crisis ripped across the entire world market. The tally of financial losses is quite staggering. The US government alone has already committed $9 trillion to its financial sector in various forms to maintain solvency. The sheer magnitude of the debt means that depressed economic conditions are likely to be long-lasting, and the distributional struggles very intense over how the bad debt – ‘toxic assets’ is the euphemism of the day to disguise the massive market failure and incompetency of the financial sector – is destroyed, socialized or inflated away. The financial chaos is causing untold damage to workers. The ILO has suggested that global job losses could reach as high as 51 million for 2009. Competitive imperatives will compel capitalist firms (as well as state employers) to restructure workplaces and challenge union contracts. This will build on what is now a three decades old ‘employers’ offensive’. The offensive emerged in the late 1970s as capitalists attempted to restore company profitability and control over the labour process after considerable erosion over the postwar boom. The rate of profit had fallen by about half over the postwar decades across virtually all zones of the world market. The decline in profit rates coincided with a push by unions and workers to gain an increasing share of output, to expand public services and to address inequalities facing women and racial minorities. These efforts were backed by the largest and longest strike wave in the history of the advanced capitalist countries from the mid-1960s to across the 1970s. The capitalist classes responded with a number of strategies to the union militancy and declining profits. At the level of the state, neoliberal policies from the 1980s on deregulated markets imposed fiscal austerity, cut welfare, liberalized trade and capital flows and so on. In terms of workplaces, this meant increased ‘flexibility’ in terms of job controls, wages and employment. Firms have re-organized their labour processes into international production networks and shifted work into low-wage, weak-union production zones. Information and communications technologies have facilitated the introduction of ‘lean production’ intensifying work processes. Employers have broken with ‘standard’ work arrangements and increasingly resort to contingent work arrangements, cheap migrant labour pools and temporary work programmes. In collective bargaining, unions increasingly trade-off wage restraint and workplace concessions against job security, agree to co-management schemes for firm competitiveness, and even enter into ‘voluntary recognition agreements’ to gain members while giving up the right to strike and other job controls. The employers’ offensive has made ‘competitive unionism’ the dominant practice, in both the public and private sectors, in North America. In terms of wages the focus was on curbing real wage gains for workers and breaking a linkage between productivity gains and annual wage improvements. More of output increases would thus go toward profits. The economic crisis has made employers even more militant in their demands for wage austerity and concessions. One strategy has been cuts to negotiated health benefits (insurance plans in the US) for current employees and retirees, as well as other benefits. Another emerging strategy is to redefine – or even walk away from – pension obligations, as has occurred in the steel and auto sectors and in numerous non-unionized companies. Work intensification is also occurring as workers are being pushed to give up time-off, holidays, work breaks, and so forth. Marx argued in Capital that each phase of accumulation contained the seeds of its own destruction. The internal contradictions of neoliberalism are now readily apparent: fictitious capital and debt massively growing relative to the growth of productive capacity and the deterioration of public services; wage compression leading to increasingly indebted working classes and unstable conditions for effective demand; the undermining of extra-market regulatory capacities to constrain capitalist competition, speculative bubbles and fraud as an endemic feature of financialization; and huge international payments imbalances reinforcing dependence on the world market while spreading its potential instabilities. Neoliberal and free market ideology is now totally discredited. But capitalist strategies and government policies are attempting to reconstruct neoliberalism as the basis for again restoring capitalist profitability. This is the political challenge the union movement now faces. Existing union strategies are neither confrontational enough to challenge capitalist workplace strategies after years of concessions. Nor are they politically ambitious enough to form the necessary anti-capitalist strategies to form the political agendas and organizational capacities to forge an alternate approach to the crisis. There are, however, several hopeful signs of union renewal that could begin to chart a new direction. In North America, some of this has come from ‘living wage’ struggles led by local labour councils in major cities, in alliance with community groups, to reach out to the low-waged and unorganized, who are predominantly women and people of colour. The mass immigrants’ rights May Day protests, as well as the day-to-day campaigns for the protection of non-status workers, have taken place outside the main union movements, but also led to new linkages and alliances. A number of campaigns – notably some of the anti-privatization struggles around healthcare, universities and municipal services – have had successes across several countries. These community-union alliances, often coupled with major campaigns and demonstrations, suggest enormous potential. There also have been interesting examples of a new organizational internationalism amongst unions. The efforts to coordinate aspects of collective bargaining in the steel, auto and healthcare sectors, extending from North America to both Europe and Latin America, to confront work issues spread across international production networks, is one example. The campaign against the militantly anti-union Wal-Mart is also suggestive. 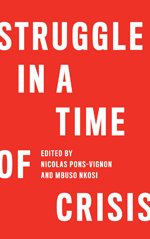 In the context of the economic crisis, it is necessary to form a set of demands that might converge across different struggles and sectors to embed an anti-market logic in bargaining that might offset the worst features of the slowdown. In terms of workplace struggles, a core set of campaigns might be: (1) the fight against concessions in wages and benefits; (2) in the preservation of negotiated pensions; (3) building in annual reductions in work-time within wage negotiations; (4) support for plant occupations and community seizure of assets, particularly in cases of bankruptcy and firms receiving state subsidies; and (5) and extension of all other forms of hours reduction in terms of parental leaves, annual holidays, over-time, and so on. A set of union demands directed at the economic crisis is also important: (6) the overhaul or unemployment insurance systems in terms of benefits, principles of eligibility and administration; (7) industrial strategies directed at ecologically responsible production; (8) massive extension of ‘green jobs’ in the culture, leisure, and sporting sectors; (9) nationalization of the banking sector; (10) building a national childcare system; (11) nationalization of the transportation sector and development of a national mass transit strategy; and (12) establishment of a national housing programme. These types of demands, of course, have been percolating through the union and socialist movement for some time. They will depend on reversing the decline of the union movement and the wider impasse of the Left. Working class political organization has in the past achieved a great deal: leading de-colonisation struggles; campaigning for the expansion of freedoms and equality to women and racial and sexual minorities; improving wages and benefits; and agitating for the extension of universal welfare states. The social forces that achieved these gains are now quite something else: the communist parties have all but disappeared even in places where they once held power (or they have made their peace with capitalism as in China); the social democratic parties now chart a ‘Third Way’ and no longer even pose a reform agenda to neoliberalism; unions are in retreat; and many civil society movements have evolved into professionalised NGOs navigating the grant economy. The central political coordinates for labour movements over the last century – being for or against the Russian revolution; attempting a vanguard seizure of the existing state apparatus or reforming it piecemeal; conceiving unions as primarily the industrial wing of this or that political party – no longer provide any kind of map for the struggles unions and workers now confront. For a brief moment, it seemed as if a decentralized ‘network politics’ – a ‘movement of movements’ – would provide, if not a map for the future, a renewed political capacity for the Left. It was represented in the hopeful ‘Teamsters and Turtles’ slogan of the heady days of the anti-globalization movement. But apart from episodic demonstrations and annual social justice fairs, the networks have broken apart more often than they have provided new organizational nodes. There has been almost a complete lack of organizational grounding in the day-to-day struggles of working class communities, workplaces and unions. This ‘anti-power’ politics is now being eclipsed by new political experiments beginning from – and not against – organizational commitments to unions and political parties. In Latin America, this has taken place under the banner of building 21st century socialism in a number of countries. A ‘new’ New Left appears to be emerging from the margins in Greece, Germany, France, Portugal and other places as well. From their anchor in workplace struggles and in particular communities, a renewed union movement is a crucial component of such a new Left. Indeed, in representing the deep diversity of workers and their issues – in terms of gender, racial background, sexual diversity, and so forth – unions have been leading society in this area over the period of neoliberalism rather than following it. Moving on will require forming new political capacities and an organizational openness and creativity that the Left in North America has not shown for some time. That realization is always the point of a new beginning. Gregory Albo, is Associate Professor, Department of Political Science, York University, Toronto. He teaches courses on the foundations of political economy, Canadian political economy, alternatives to capitalism, and democratic administration. "a push by unions and workers to gain an increasing share of output, to expand public services and to address inequalities facing women and racial minorities"
In the REAL WORLD, the American unions didn't do a damned thing for African American workers - everything we got from the bosses we won ON OUR OWN, DESPITE THE RACIST UNION CHIEFS. And before you call me "anti labor", know this - I'm a union carpenter (Local 608, Westside of Manhattan, New York City), a shop steward and a prolific blogger and author on labor topics. Lets not spread the myth that America's racist labor movement ever did anything for the Black worker. Nor should we spread the myth that they're helping the Latino immigrant - La Gran Marcha and the Great American Boycott happened OUTSIDE OF the mainstream union movement. Historically, the biggest problem American labor has had over the last 400 years has been the White supremacism of White American labor leaders (which reflects the racism of their White followers to a large degree). We cannot overlook that fact if we want to build a new labor movement. The much desired debate on the ‘ways ahead’ requires also an honest debate of what keeps the unions somehow hostage of the capitalist system and stops them from pursuing a more radical agenda. Why have unions become prisoners of the system, despite such a rich history of struggles’? Part of the explanation may rest with lack of an articulated vision which can win people’s minds and hearts. Other explanatory areas and eventually questions may be related to the duality of trade union organization as ‘sword of justice and vested interest’ (Flanders, 1970), which as Hyman warns is a balance changing over time. How does this balance change? Which are the internal processes that movements go through to transform into ‘sword of justice’? How does unions’ self-belief and conscience play out in these transformative processes? Exploring on the issues of self-belief and conscience is not the answer to all the questions given the complexity of unions as organizations. However, a serious assessment of alternative workers’ initiatives, which could shed light on “how self-belief is created inside the movement and beyond and what are the processes that lead to this” (Novelli & Ferus-Comelo, 2008), is an important stepping stone in the debate of analyzing the ways unions can become agents of social change. This would require bringing together those great workers’ experiences worldwide – often left unnoticed by the mainstream media – which challenge the capitalist system and revive the hope for social change. Indeed, as Patrick Reinsborough reminds us ‘analysis is shaped by experience’. The process of strengthening union self-belief and transforming the conscience needs to go hand in hand with the process of thinking and shaping the vision for the future and they indeed may reinforce each other in complex processes. Hence, any realistic vision for the future would need to be rooted on peoples’ struggles which rebuild and strengthen the belief that change is possible.